"Thinking" As an Advanced Stage of Children's Learning Process - My little smart mind is indeed very adorable. However, did you know if this didn't just happen? In the learning process, there are several steps that must be followed, namely observation, thinking, and action. Without knowing it, when you see and observe something, the process of thinking starts. Come on, know the stage of development of your child through the following review. Thinking is an advanced process in the learning process of the child. In this stage, your child processes information from what he hears and sees and then stores it in the brain. 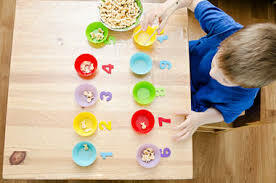 When this process takes place the logic of the child start working and produce a result, which is changing action to imitate or it can also be a problem solving. For mothers who want the baby's thinking process to be more maximal, can provide support in the form of providing the right nutritional intake. The fish menu, especially tuna and salmon is a healthy menu rich in omega-3 which can improve children's brain development. By providing the right food intake, the learning process of your child will be more smooth. definitely want to have children who are easy to receive information and can process it well. Some children may experience poor thinking skills. This is indicated by the process of capturing information for a long time. However, Mam doesn't be anxious and even say rude things that can make her mind down. Try to encourage your child to play outside. A cool and comfortable natural atmosphere will make his mind more open and relaxed. On that occasion, try fishing your little one to think critically. For example, "Wow it's raining, how come we can take shelter there without getting wet?" this simple thing will stimulate your child to think, find solutions and find answers. Mam, get ready to hear the little answers from various people. However, when he succeeded in providing the right solution, give him praise to be more confident. Sharpening your child's thinking ability does need patience. However, believe me, if every child has the same opportunity to be smart and smart. So, let's continue to help your little one, Mam.